The Grant Wood Digital Learning Team works with AEA 10 schools to help them integrate technology in the classroom. We work with teachers and administrators on-site, and at Grant Wood facilities. Each school district is assigned a Digital Learning Consultant to help facilitate the ways in which we can help schools improve teaching and learning with technology. You can see a list of the consultants and the districts they serve below. Stacy is a former elementary and middle school teacher and also spent some time as a district technology director. Before taking over the helm as the Coordinator of Digital Learning she was a technology consultant at Grant Wood AEA. She serves on the the state ITEC Board. Stacy is a Google for Education Certified Innovator and Google for Education Certified Trainer and enjoys learning from and with students new ways to incorporate technology in teaching and learning! Julie Freed is a licensed speech language pathologist who is currently serving as the GWAEA Assistive Technology Team Lead. Julie graduated from the University of Nebraska-Lincoln and has extensive background in the field of augmentative communication and assistive technology for the past 26 years. Julie actively participates in the Iowa State Assistive Technology Liaison group and also serves as a member of the National Bookshare Advisory Committee. Julie and her husband, David, live outside of Lisbon with a daughter in the Cedar Rapids area and a son living in Kansas City. Districts Served: Agency-wide support to IEP & district teams. Jonathan Wylie is a certified teacher with 10 years classroom experience. He taught elementary students in Scotland, England, and the United States. As a Digital Learning Consultant for Grant Wood AEA, he works with teachers and administrators to find the best ways to use technology to enhance teaching and learning in the classroom. He lives in Troy Mills with his wife and two children. Districts Served: Alburnett, Cedar Rapids, Central City, Isaac Newton Christian Academy, North-Linn, Olin, Springville, Summit, Trinity Lutheran. 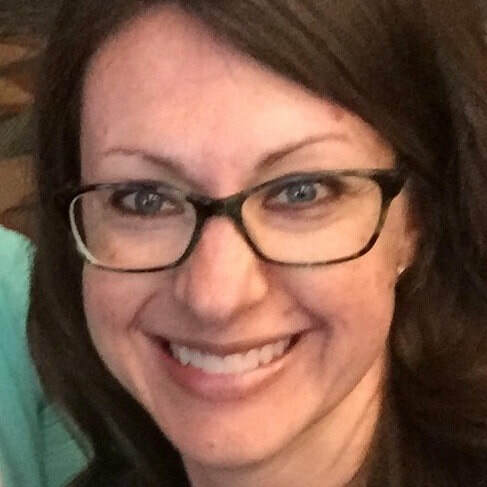 Gina Rogers is an instructional technology consultant at Grant Wood AEA in Cedar Rapids, Iowa. Before accepting her position at GWAEA, Gina was a high school English and Language Arts teacher in two 1:1 districts in eastern Iowa. She lives in Iowa City with her husband and two children, Jack and Willa. Gina is passionate about finding ways to integrate technology to help learners meet curricular goals. Lynn is a digital learning consultant with 17 years educational experience. Prior to joining the Digital Learning Team, Lynn worked for 3 years as a Teacher Librarian for 2nd-5th graders and taught 7th grade Reading for 13 years. Lynn is dedicated to supporting the integration of technology and information literacy skills in every classroom. She works to support and empower Grant Wood AEA teacher librarians through professional development opportunities, #gwaealibs and the Sharing Our Stories blog. She believes strongly in advocating for #FutureReady schools and #FutureReady Librarianship. Lynn resides in Atkins with her husband, Nathan, and two children, Jackson and Ava. Districts Served: Belle Plaine, Benton Community, Central Lutheran, English Valleys, HLV, Iowa Valley and Vinton-Shellsburg. Amber is a technology consultant and certified teacher with 10 years of classroom experience as a middle school science teacher. She believes technology should seamlessly blend into the learning environment in a way that enhances classroom relationships. Amber is a Google Certified Educator Level 1 as well as an advocate for flipped learning. Amber also believes makerspaces offer students unique learning and problem solving opportunities to help empower and engage students. Amber is a co-host of a YouTube Makerspace Challenge show for schools called Think, Make, Innovate. She lives in North Liberty with her husband, Bob and daughter, Stella. Beth Swantz is a certified elementary teacher and Teacher Librarian. She has 25+ years of teaching experience in a variety positions including a 4th grade teacher, Secondary Teacher Librarian and a K-12 Learning Design Coach. She specializes in Blended and Personalized Learning and co-facilitates the Blended Learning cohorts at GWAEA and teaches the grad course work that accompanies the cohort. Beth believes in the coaching model for impacting teacher learning and counts her time supporting instructional coaches in schools across the agency as an especially positive practice. Beth and her husband live near Kalona. Mindy Cairney is a certified elementary teacher with 13 years of classroom experience. She has taught in grades kindergarten through second grade during this time. Technology has catapulted teaching into a new dimension of thinking and learning. Mindy is passionate about helping teachers use technology to enhance the instruction and engagement of students. She specializes in early elementary technology, Seesaw, DefinedSTEM, podcasting, with a special love for QR codes. Mindy lives in Cedar Rapids with her husband Steve and two kids: Tate and Annabel. Districts Served: Xavier Catholic Schools, St. Patrick's, Sacred Heart, Cedar Valley Christian, Center Point-Urbana, Midland, Monticello, and Anamosa. Corey is a certified secondary teacher with 8 years experience teaching middle school STEM, 3 years experience as a middle school media specialist, and 4 years experience as a school improvement and instructional technology consultant. She is passionate about coding, STEM, inquiry-based education, and personalized learning. She lives in Iowa City with her husband, Glen, and kids, Rory and Howard. Districts Served: Lisbon, North Cedar and Linn Mar.